Streetcar No 23 was built in 1906 by the Stephenson Car Company, a division of the J. G. Brill Company of Elizabeth, New Jersey, U.S.A. It was the fourth in a series of 25 cars ordered for the ‘3-cent’ Forest City Line of Cleveland, Ohio, U.S.A. It was built as a double-ended, semi-convertible car and was numbered ‘3334’. In 1908, it was re-built as a single-ended car and re-numbered ‘934’. 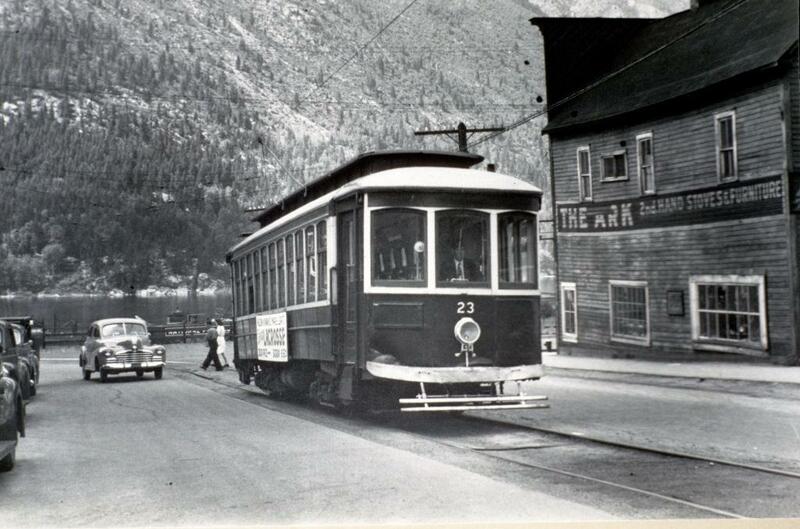 In 1924, the City of Nelson purchased Car 934, to supplement the existing Cars 1 and 2 which were in use at the time. On its arrival, it was re-painted and re-numbered to ‘3’ and was used when one of the other streetcars was out of service or for special events, such as picnics or hockey games. Early in the 1930’s, the streetcars were re-numbered from ‘1’, ‘2’ and ‘3’ to ’21’, ’22’ and ’23’ in an attempt to make the tramway system seem larger than it was. Car 23 remained in use until June 20, 1949, when service on the Nelson Street Railway was suspended and service was replaced by buses. In 1951 Car 23 was purchased for $10 by a Veterinarian and re-located from Fall St. Park to Nasookin Road four miles east of Nelson on Highway #3A . It was completely stripped, had three inches of concrete poured on the floor and square holes cut along one side, to convert it into a dog kennel. It also served as a chicken coop, then storage shed for a souvenir and crafts shop.